Do you like music? I like music. I also like science. As a result, nothing makes me happier than when the two combine forces to form a Sciencey-band of some sort. But alas, no such thing exists, I hear you say. Of course, I believed the same until Friday 9th of December, when a peculiar sound was introduced to me. What sort of sound? 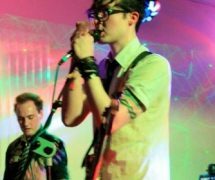 Why, it’s the sound of We Are The Physics, a quartet that purveys ‘Mutant Science Punk Rock’, or so they call it. Now, this all sounds very strange. Well, I’m not going to lie to you – it is very strange. Stranger than anything I’ve ever encountered in Elliot’s Bar before. And that was the chief venue of my own band, so you really know how strange it is. But, as it happens, I like strange, and I like to think that you do, too. 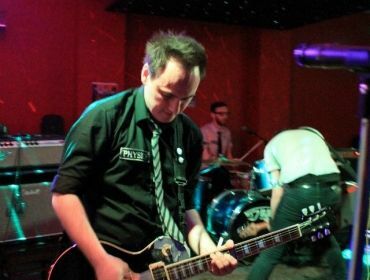 We Are The Physics hail from Glasgow (yes, the Scottish one) and have been performing since 2005, producing records since 2006. 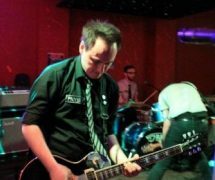 Signed to the Japanese-Indie label Magnetic Records in 2008, We Are The Physics have toured all over, getting drunk on Russian vodka and making friends with death metal fans in Finland. 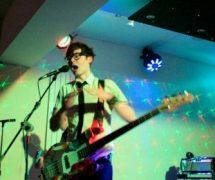 Consisting of three Mikes, a Chris, 2 pairs of thick-rimmed glasses and 6 spindly legs, WATP have played with the likes of Franz Ferdinand and 30 Seconds To Mars, as well as playing major stages at festivals such as T in the Park and NME. 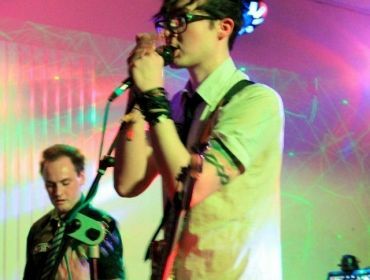 So, what the Sam-heck is such a fantastically awesome band doing in Aberdare? That’s gotta be a lot of petrol, surely? Well, thanks to Voodoo Lobster Promotions, the three Mikes and a Chris were more than happy to add our little town to their tour of London and Nottingham. Chuffed? You bet we were. And after listening to them, you would be too. WATP performing truly was a sight to behold. 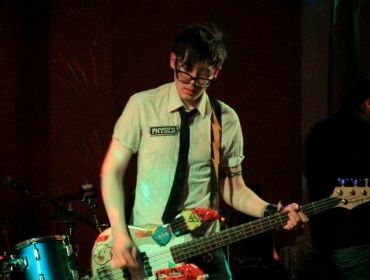 Lead singer Mike (as opposed to Guitarist Mike and Drummer Mike) struck me as a crossbreed of Jack Skellington and Moss from the IT Crowd as he marched around the stage with his bass guitar. 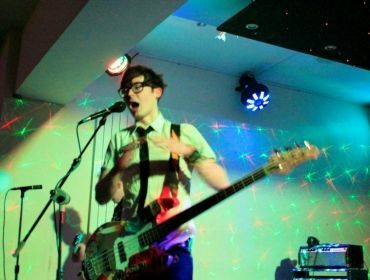 The jerky movements, high energy and yet exposed vulnerability of the band’s performance gave me the distinct feeling that I was watching a nerd trying to dance at his first party… or maybe a robot of some sort. The connection between the band members was nothing that I’d ever seen executed so perfectly by a live band before, and I’ve tried and failed to draw a parallel between them and any other band to give you an idea of what they sound like. At one point, I thought they were like The Hives, the next I was reminded of System of a Down, the next of The Sparks. I finally came to the conclusion that to describe how they sound is an almost impossible feat, and can only ask you to listen for yourselves over at http://www.wearethephysics.com/listen. Even to a completely new audience, WATP managed to get everybody on their feet as they headlined a cracking bill. Their quirky performance held surprises from a chorus of “Your milkshake brings all the boys to the yard” to a song where they stood frozen for its entirety. 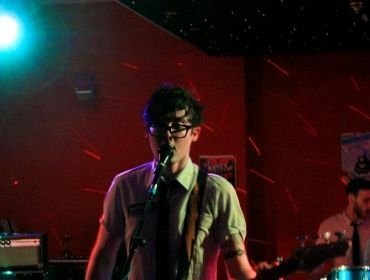 After spilling his water and being dragged into the crowd, lead singer Mike made a plea for sandwich money and WATP bid their farewell from Aberdare, where it is safe to say they had a lasting impact. If you’re looking for something weird and wonderful to listen to through your music-playing device-mabob, then I think I may have found it. My music taste stretches from the proggiest of rock to the hippiest of hop, and I’ve yet to come across anything close to this. 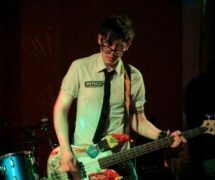 Whether it’s their biggest selling single ‘You Can Do Athletics, BTW’ or the 8 second song ‘Drawing Anarchy Signs On Your Pencil Case Is Redundant’, WATP’s tongue-in-cheek geek chic music is consistently innovative and is almost guaranteed to put a grin on your face. 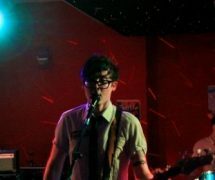 NB: Attached is a video of the gig itself, accredited to Adam Jenkins. The sound quality was much better if you were actually there, and so I recommend you listen to them on their website. IT WAS AWESOME THOUGH.